Aloo Bonda is a tasty irresistible snack most popular in Mumbai, other parts of Maharashtra and as well western India. It is one of the popular chats served in parties. Aloo Bonda is a yummy potato spicy ball wrapped in gram flour batter. 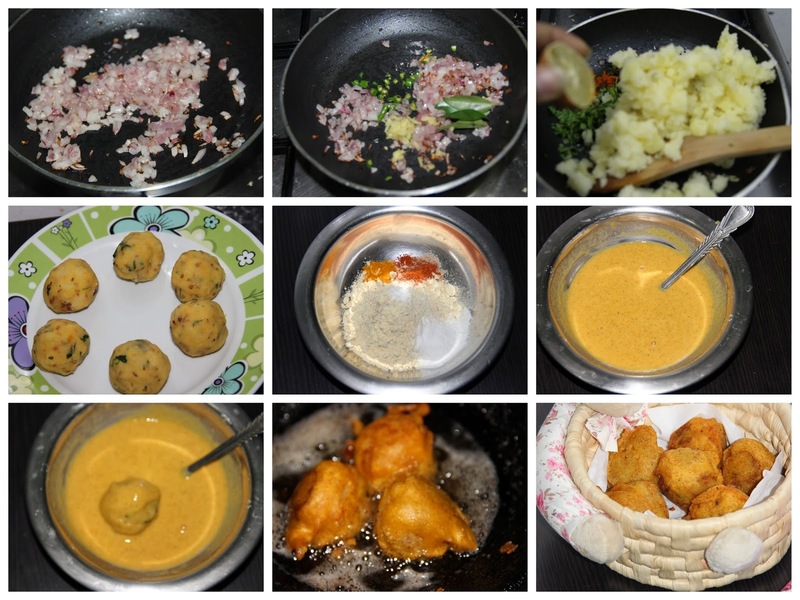 This can be easily made, by dipping the potato balls in dosa batter and deep fried. Pressure cook the potatoes till soft around 4 whistles on medium flame. In a hot pan add oil and jeera and onions, when the onions are soft, add green chilli, ginger, asafetida and curry leaves. Cook till the raw ginger smell leaves. Then add red chilli powder, mashed potatoes, salt and coriander leaves. Cook for two minutes and put off the gas and add lime juice and allow the mixture to cool. From this mixture take a scoop of the mixture and roll into big lemon sized balls. In a deep bowl mix gram flour, rice flour, turmeric, red chilli powder and salt. Mix well the dry ingredients and add water to form a semi thick slurry. Dip the potato balls in to the slurry and allow to coat well. Heat the oil in a pan till smoking hot and reduce the flame to medium and deep fry bonda's till golden brown.